This is achieved with two speakers providing 2.5 W each, although this reduces to 1.5 W when powered by the built-in battery. When many premium digital radios have a single speaker, the Sony XDR-V20D should make the most of stereo DAB stations. The Sony radio is controlled with a round tuning wheel and the surrounding buttons, all of which are on the top of the unit. Scrolling the wheel will move through the list of stations, while the enter button will tune to the station highlighted on the display. Plus and minus buttons control the volume. Five preset buttons for FM and DAB are also found on the top of the radio. There isn’t a single button to toggle between FM and DAB, but the function button will choose between DAB, FM and Audio In. The Audio In mode allows for a mobile phone, tablet, MP3 player or other device to be connected to the radio. The stereo speakers will provide improved sound for music or podcast listening. When the DAB radio is switched on for the first time it will scan for available stations. The radio will then tune to the first station in the alphabetical list. The auto scan can be repeated later by selecting the DAB mode, then pressing the Auto Tune button. This will clear the list, removing any stations which are no longer available. An interesting feature of the radio is the ability to perform an FM auto scan. This is done in the FM mode by pressing the Auto Tune button and the radio even offers to get the FM station names. Unfortunately the DAB and FM lists are not merged together for easy selection of FM and DAB stations. 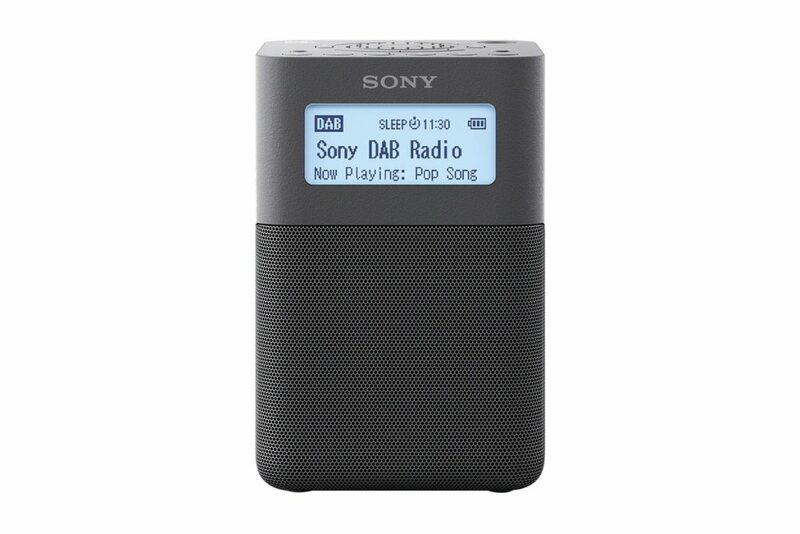 Where the slightly bigger XDR-V1BTD is available with three different wood colour options, this Sony XDR-V20D portable digital radio comes in four solid colours. On battery power at moderate volume levels the battery should last around 17 hours. When the volume is set to the maximum available this is reduced to 15.5 hours of FM, or 11.5 hours of DAB listening. If the built-in battery level is too low to switch the radio on a beep will be heard. This means that the AC adapter should be plugged in. This is also the case if the volume won’t exceed level 22. In standby mode the radio displays the time on its display. To save power and switch the display off completely, the power button can be held down for two seconds. In standby mode power consumption is 0.6 W, dropping to 0.2 W in the ‘off mode’. Power is provided using the supplied AC adapter or with the built-in lithium-ion battery. The Sony XDR-V20D’s footprint measures around 10cm by 12cm (4 inches by 4.6 inches) and is just 16cm (or 6 inches) high. This makes the radio slightly shorter and lighter than Sony’s XDR-V1BTD. Verdict: High quality stereo sound and a small, stylish design set this Sony radio apart from many other DAB sets.